There's nothing technical about this stretch of the Catawba. Occasionally, higher water flows can make the upstream portion of the trip a bit taxing. From the Belmont put in to the USNWC and back should take around two hours paddle time but there's plenty of other areas to explore further on. The boat launch is open all year but paddling in the winter offers a bit more challenge to stay warm. Plenty of pups ride kayaks and canoes out of the Belmont launch. 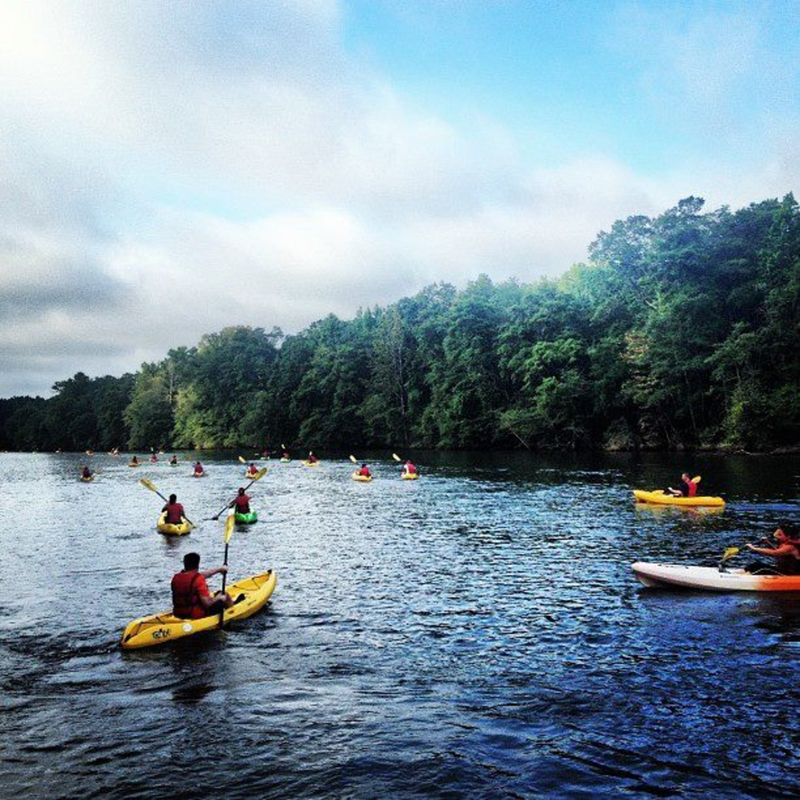 Forming the western border of Charlotte and Mecklenburg County, and feeding many of the lakes in this part of the piedmont, the Catawba River is the source for some of the best flat water paddling near the Queen City. The section of river that flows past the U.S. National Whitewater Center is smooth and calm with lots of opportunities to duck in small coves and circumnavigate islands. Osprey, hawk, and sparrows roam the skies while bass and carp swim below. Between highways 74 (Wilkenson Blvd) to the south and 27 (Mt. Holly-Huntersville Road) upstream, the Catawba River flows gently past mostly tree lined banks. Osprey launch from purpose built nest platforms and cruise the sky looking for their next meal. Turtles watch kayakers float by, hopping off logs to watery safety when they come too close. And with several put-ins along this stretch of water, this piece of river sees a lot of kayaks - as well as canoes and stand up paddleboards. If you have a boat, try the put in south of the USNWC, next to Wilkenson Blvd. The city of Belmont recently purchased this land as part of a larger planned river park. From the launch to the left and paddle upstream for a couple miles. You’ll cruise under the Interstate 85 bridge where cliff swallows build their mud nests. It’s common to see a detachment of these fighter-jet-like birds harrying a much larger hawk, protecting their little community from the big raptor. You’ll also spot great blue herons lift off from the bank in an impossibly slow and graceful takeoff, gliding a few feet above the water. Stay in the main channel until you see the Tailrace Marina on your right. That means you’ve also reached the USNWC. Just passed the marina, and large island, take a right and spot the USNWC’s boat dock. Paddle towards it and, a hundred yards before you get there, look for a simple, mud boat put in. If you’re up for a two-sport day, pull your boat in here and head out for a jog in the trails. Or simply grab a sandwich and beer. 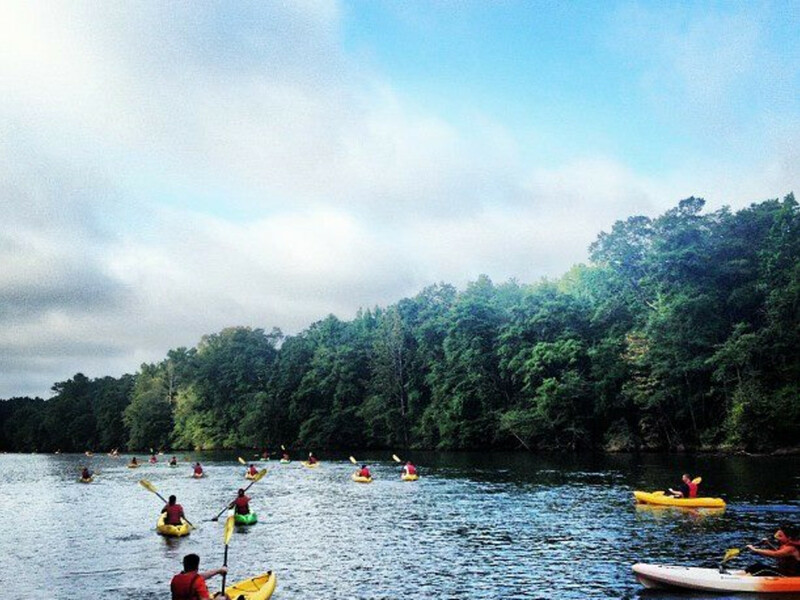 If you don’t have a craft of your own, start at the USNWC. They rent sit-on-top kayaks (singles and doubles) as well as stand up paddle boards. For those who feel that paddling is basically hiking on the water, where taking in the scenery is more important than getting anywhere in a hurry, this is a great option. On weekends you likely won’t be alone on the water, especially near the outdoor center, but you can tuck into some small coves or the backside of little islands to get away for a bit. The entrance to the Belmont launch is located just west of the river on Wilkinson Blvd and is easy to miss. Make a U-turn at the very first light and then a right into the gas station. Follow the parking lot passed the second building in the lot back towards the river. The short driveway at the back of the parking lot leads directly to the lot and parking lot. There are no services here so come prepared with water, snacks and sunscreen. Written by Rob Glover for RootsRated.